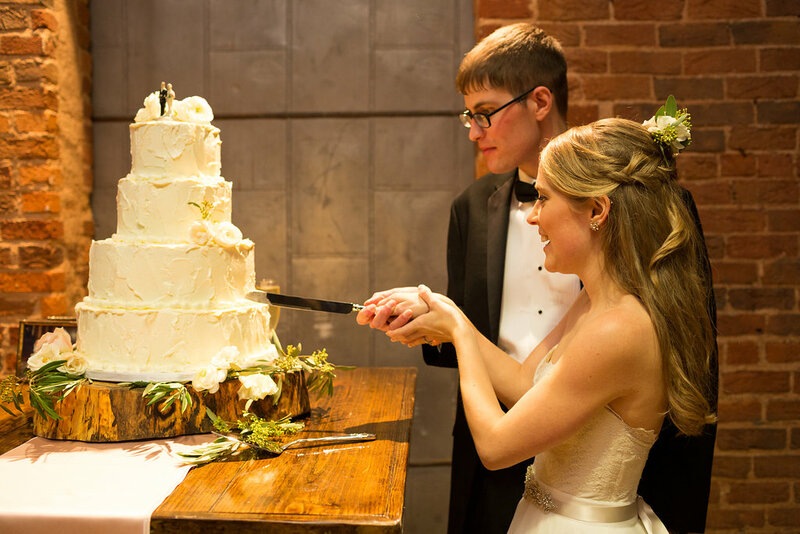 Over two months ago we had a big party to mark the start of our happily ever after. Maybe you've heard me mention it a time or two? Well I'm still not done mentioning it. After the ceremony our guests slowly made their way downtown to the reception cocktail hour while we were taking photos. 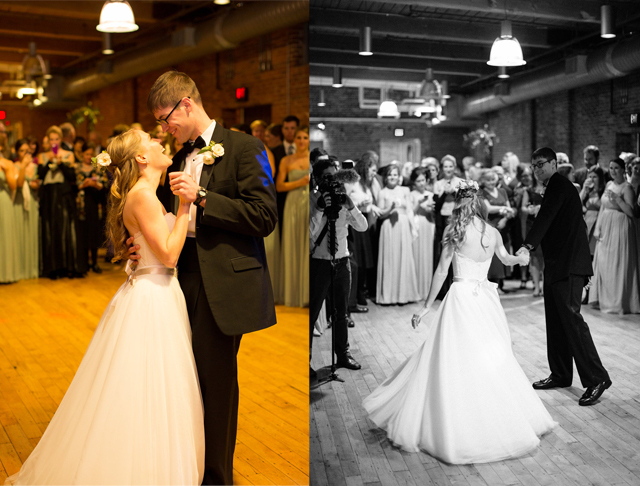 Our reception was held at The Loft. It's a converted textile mill on the water downtown. 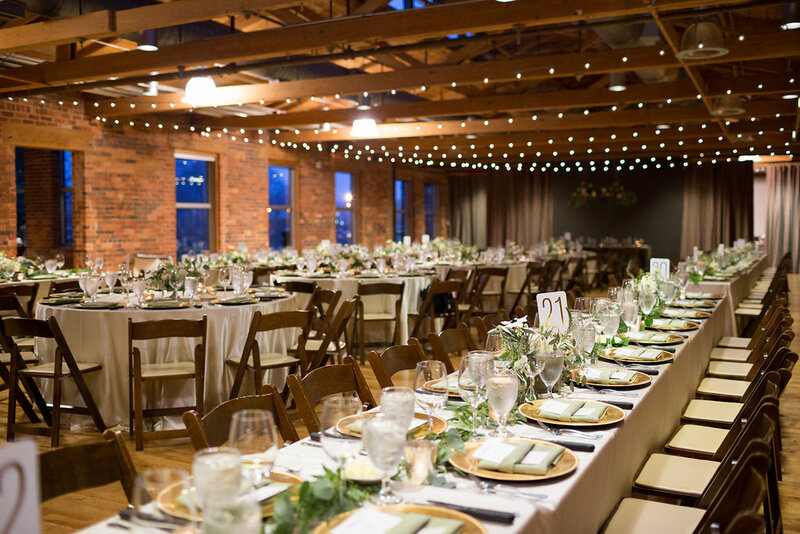 All high woodbeam ceilings, brick walls, arched windows overlooking the river and the city skyline, and lots of cool rustic and industrial details. It was the perfect spot for the style and look that I had in mind for our day. Our wedding planner did this fantastic job of transforming the space with our dream team of vendors. 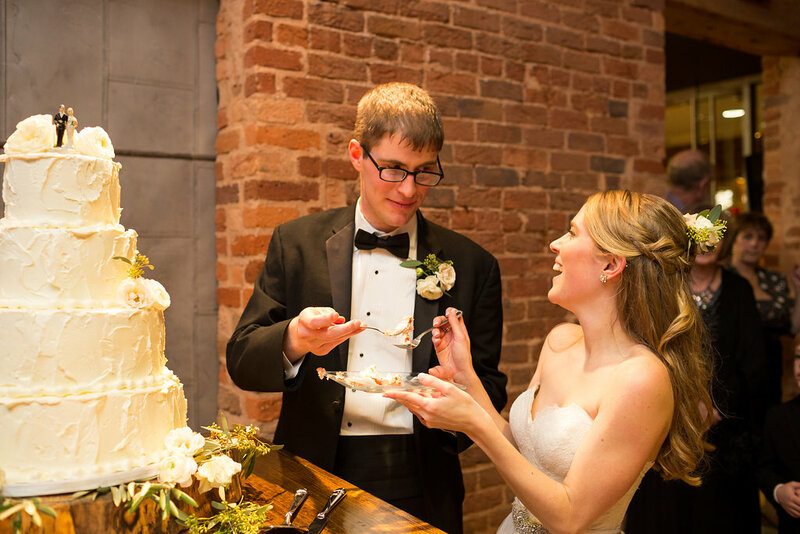 And the night before the wedding she allowed me to unload all my DIY details, menus and place-cards, a seating chart, favors and chalkboards into her car and I didn't have to worry about one detail on the day! The venue actually has two connected spaces. In one room dinner was served. We did a combination of round tables and long banquet tables with boxed florals spilling flowers and long flowy garlands running the lengths of the tables with votives casting a pretty glow around the room along with the twinkly cafe lights strung across the ceiling. 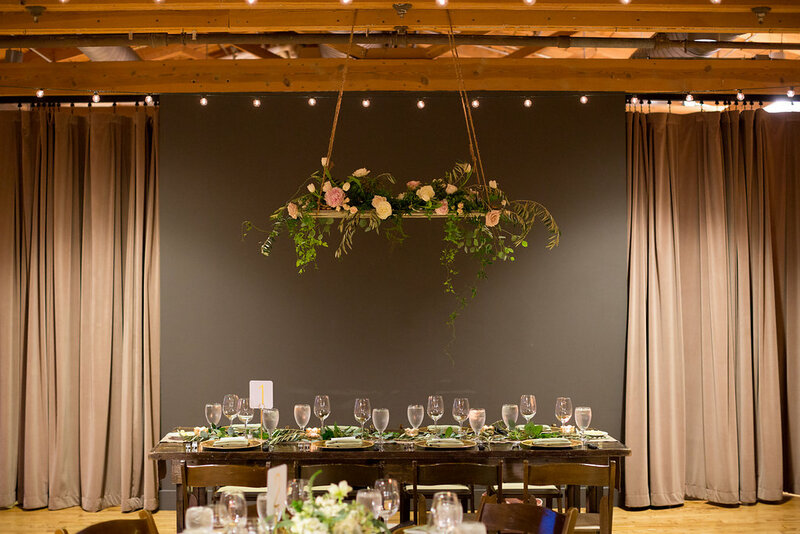 Above the head table was a dreamy hanging floral arrangement. I had seen something similar on my photographer's page and that's when knew I needed to hire that florist. We also had rented two vintage dressers, one for displaying the seating chart and our guest book and the other for holding all our handmade/homemade favors. 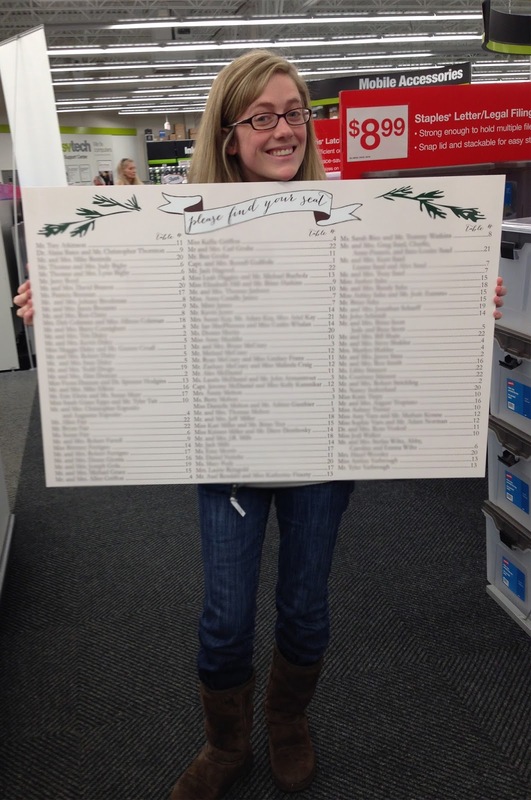 I designed our seating chart and had it printed at Staples. We then attached strips of magnets to the back so it would hang on this sliding metal barn door in between the two rooms. 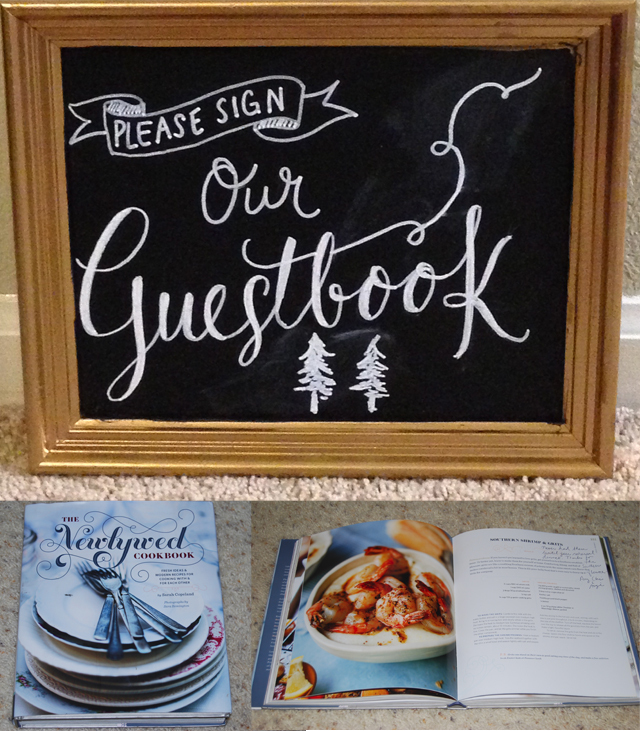 Our guest book was "The Newlywed Cookbook." I love that when I actually use this cookbook over the years I will see well wishes and love from our friends and family. 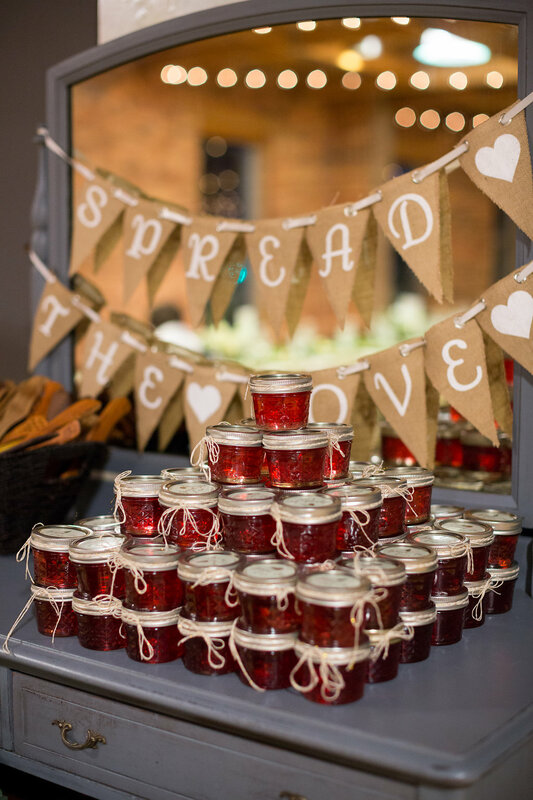 And our favors were homemade "Sally Berry" Jelly made by my grandma Sally. I printed stickers for the lid and together with my mom, sister, aunts and grandma, we tied them all with gold glitter bakers twine. In addition, a dear friend of T.J.'s family made wooden spoons, spreaders and honey stirrers. Each one said our name and wedding date plus the type of wood it was made from. 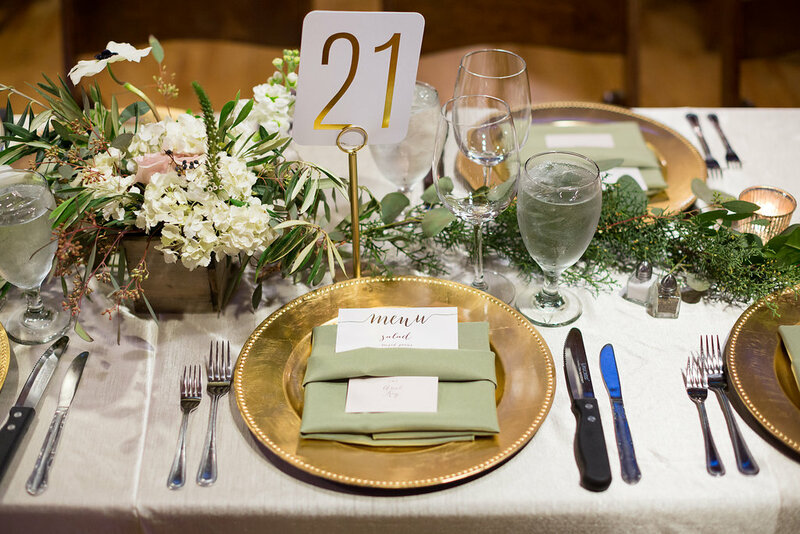 I loved having these two distinctly personal touches and love how they looked displayed on the day. In the adjoining room we held our cocktail hour and then later it's where all the dancing went down. It was filled with cocktail tables tied with burlap bows, a four-sided bar in the center of the room (I hate queuing at a wedding so this cut out that problem), two lounge areas with vintage tufted couches and chairs and two more hanging floral arrangements above, and we displayed our cake in that room as well. We worked with my favorite Greenville restaurant for the catering and they made everything as if you had ordered it off the menu yourself. For cocktail hour we had two stationary hors d'oeuvres: Mini Chicken and Waffles with Cranberry Syrup, and Vegetable Crudite Cups. 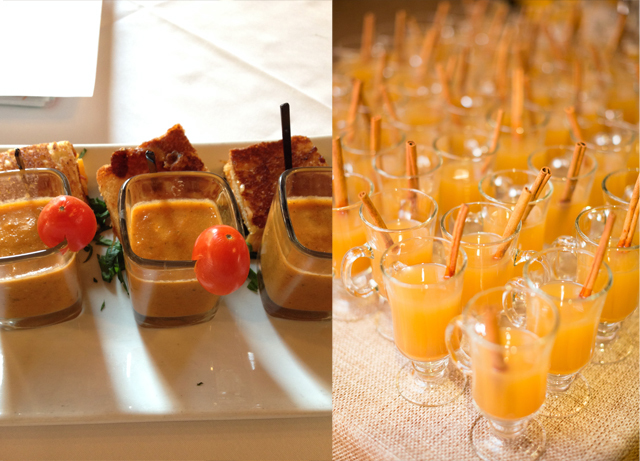 Then we had three passed hors d'oeuvres: Deviled Eggs, Tomato Soup Shooters with Pimento Grilled Cheese Sandwiches, and Shrimp and Grits Bites with Red Pepper. We also had a signature cocktail, Spiked Apple Cider which was passed out to guests as they came in and garnished with a cinnamon stick. But let's back up... T.J. and I arrived at the venue and our wedding planner brought us a plate of all the different hors d'oeuvres and a couple of drinks so we could still enjoy the cocktail hour while having a little moment for just the two of us. We also practiced our first dance a bit and took a break from the picture taking, or so we thought... some sneaky aunts and uncles snapped a couple shots from up above. 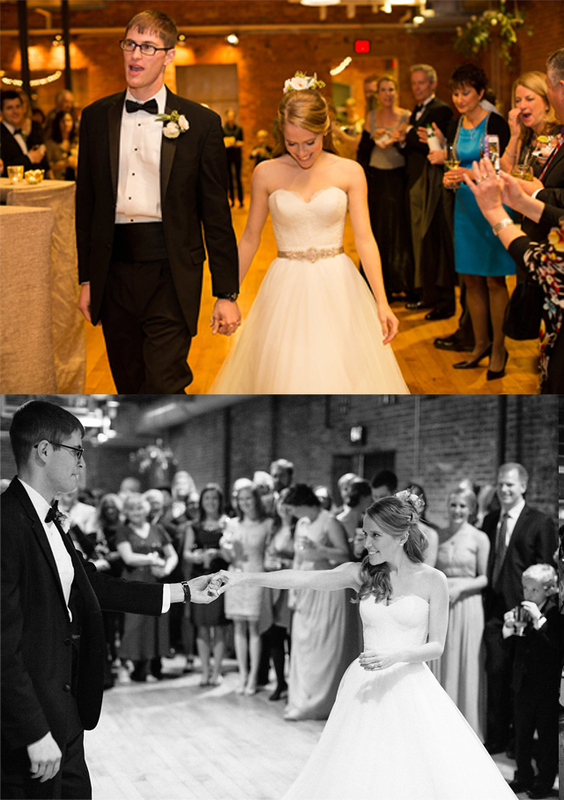 Then it was time for the real first dance. We made our "entrance," and danced to George Strait, True. I was a little nervous, all eyes on us, but it was such a fun moment and really felt like we were still just having a private moment to ourselves. After the dance, his aunt asked the blessing and we moved into the other room for dinner. For dinner we had a salad course, followed by the main course of a fillet and crab cake duet. T.J. and I did our best to enjoy the yummy meal but of course we were being pulled in a bunch of directions and had to make our rounds and visit all the tables. This was one of the reasons I chose to do a sit down, plated dinner instead of a buffet (also, remember, I hate queuing at weddings), it made it much easier to make sure we were able to see everyone. After dinner we cut the cake! We had four layers, two strawberry layers with vanilla filling and two vanilla and chocolate cake with peanut butter filling, all iced in vanilla swiss buttercream. And it was displayed on a beautiful wood round cut from a Hackberry tree and smoothed and polished by the same woman who made us the spoons. On the same table we also displayed framed photos of both sets of parents cutting the cake on their own wedding days. I know we are so lucky to both have a mom and dad who love each other and have set such a wonderful example of marriage and commitment for us to follow. Wow, what a reception, love every detail of it. You look exactly as a bride and groom should, happy, happy. it was all so pretty. Can you suggest an engagement gift? what was your favorite? I need to get a gift for a couple that is newly engaged. Any ideas?